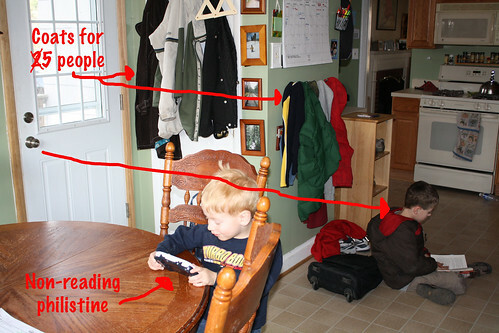 I love that this is how far Sam made it inside the house today after school before he had to sit down and read. I'm so unbelievably proud of this kid. That's how Abby was - disappearing into another world for a while. It's great. Wait until he's old enough for Harry Potter! That's so cool! My kid is starting to love to read and it's amazing to watch. Of course, it helps if the book is Star Wars, right? Has he discovered the Magic Treehouse series yet? My kids LOVE them. I love it when they get into a good book and can't put it down. I will even overlook not cleaning a bedroom if they are reading. I love it. I do that kind of thing now. Or used to before I had kids. Awesome! I love it when this happens. It's a Star Wars book, isn't it? And the philistine is pretty darn cute too. Is this a lightsaber I see before me? This is definitely HRH in training. He reads everything he gets his hands on! If you haven't yet, try the Magic Treehouses. I think we're on #18. We read them together before bed. That's awesome. You have such great kids. My son would heartily approve of Sam's choice in reading material. That is so great! I hope that my kids will love reading as much as I do! You house looks fab and clean, by the way! It's edu-mi-cation and they don't even know it! Develops imagination and vocabulary and all kinds of good stuff. Wonderful! He is a boy after my own heart! LOVE THIS! My mom used to yell at me in the car on the way home from the library to at least wait until we got home before I started reading. AWESOME! :-) A kid after my own heart. Though, your little philistine is awfully adorable, too! Yay for Star Wars inspiring readers everywhere! Thats the only sort of chapter book my 5yo WANTS to read. Think we should start a book club? I have the same cabinets, stove, microwave and coat rack for 5. Wait, that wasn't the point? Yes. And so it begins. Trust Bossy. The Damn Emos were the same. Now they can't go as far without looking in a mirror. Einey is the same way. Lately, I have to prod her up the driveway of the school because she's got her nose stuck in a book. On one had, I'm happy. But damn, it slows everything down! What a great post! Baxter's like that, too. I love it. What a sweetie! Ooh, a Star Wars book, nice!!! !